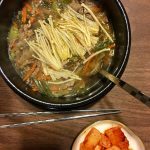 Now that winter is almost here, I’m going to show you a hearty, delicious, meaty dish called ttukbaegi-bulgogi (뚝배기불고기) that’s great for cold weather. It’s a stew made with bulgogi (Korean marinated beef) cooked in a Korean earthenware pot (a ttukbaegi, also sometimes translated as a “stone bowl” in English). You might have had bulgogi cooked as BBQ on a grill at a Korean restaurant, but in ttukbaegi-bulgogi it’s cooked and served in a stew in a sizzling hot traditional Korean eartheware pot. It takes a while for earthenware to heat up, but once it’s heated, it keeps warm for a long time. So when you first take your ttukbaegi-bulgogi off the stove it will be sizzling and bubbling, and it’ll keep warm as you eat it, all the way down to the bottom. It’s not totally mandatory to have a ttukbaegi for this dish, and you can use a metal pot if you want. I use beef skirt steak in my video, but you can use pre-cut bulgogi beef for bulgogi from a Korean grocery store if it’s easier for you. I also huge a wide variety of vegetables in this recipe, but don’t feel like you have to use everything I use. You can use whatever vegetables you like and that are available to you, but I would recommend that you don’t skip the onion. And you can also make a vegetarian version of this dish by substituting the skirt steak for King oyster mushrooms. Check out the recipe below. Happy cooking! 2 ounces large green onion (or 2 green onions), sliced diagonally. 1 ounce (about ½ cup) chrysanthemum greens (ssukgat), washed with the stems removed. If it’s not available, replace it with spinach or some basil leaves. 2 teaspoons hot pepper flakes mixed with ½ teaspoon sesame oil in a small bowl. 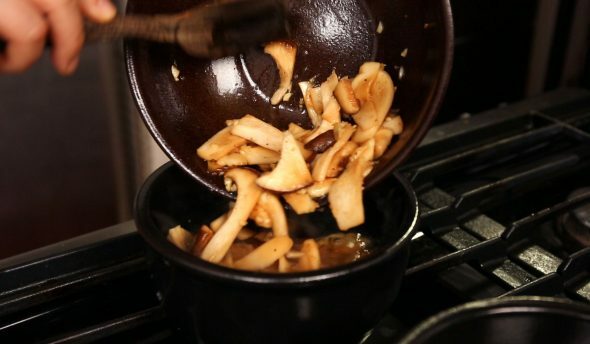 Combine soy sauce, garlic, sugar, honey, ground black pepper, and sesame oil in a bowl. Mix it well until the sugar is dissolved. Add the beef and mix well to marinate. Cover and refrigerate. 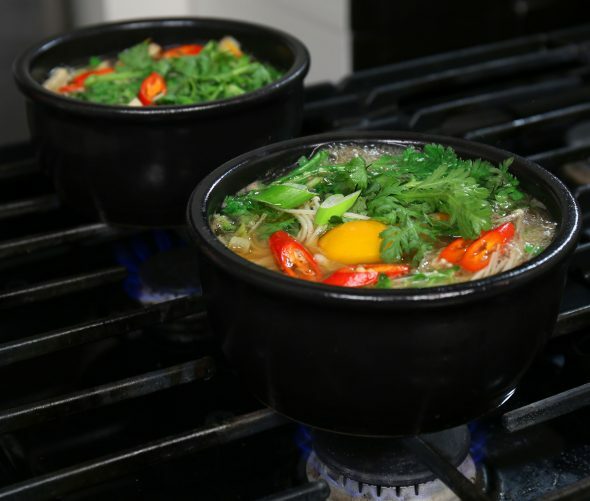 Place an earthenware pot (ttukbaegi) on the stove with 2 cups of water, salt, and fish sauce. Bring to a boil. When it starts boiling, add the beef, onion, carrot, and the large green onion. Let it cook without the lid for about 10 to 12 minutes over high heat. Stir it a few times and remove any foam from the surface with a spoon. Add the noodles, stirring a few times, and cook for 1 minute. Add Enoki mushrooms and radish sprouts and cook for a few minutes. Crack an egg and put it in the center of the bubbling stew. Garnish with the chrysanthemum greens and the red chili pepper. Remove from the heat and serve with rice, kimchi, and a few more side dishes. If you want the spicy version, put some of the spicy mixture into the stew and mix it in. The recipe is almost the same as beef version but the beef is replaced with mushrooms. And in the broth, leave out he fish sauce and increase the salt to 1 teaspoon (from ½ teaspoon). And skip the egg! Posted on Saturday, November 26th, 2016 at 12:45 pm. Posted January 26th, 2019 at 1:17 am | Log in to reply. Bulgogi in the house . I really tried … My family demolished everything in a jiff . That’s the best compliment. Thank you for sharing your recipes and cooking tips. Posted October 2nd, 2017 at 1:12 am | Log in to reply. Tried making this for the first time tonight. Had fun doing it. I liked making this after seeing the YouTube video. Posted June 28th, 2017 at 2:27 pm | Log in to reply. Posted July 1st, 2017 at 11:11 am | Log in to reply. Yes, it looks so colorful! You made a nice ttokbaegi-bulgogi! Posted February 17th, 2017 at 8:19 pm | Log in to reply. Just made this tonight. Beautiful and flavorful! I didn’t add any heat and ate it with my homemade radish kimchi. Posted February 13th, 2017 at 5:36 pm | Log in to reply. Posted January 31st, 2017 at 3:41 am | Log in to reply. I just made this for the first time yesterday and it was fantastic! I wanted to make this stew for a while but only just recently found chrysanthemum greens. Great choice on using skirt steak, so tasty! My husband asked me to made again for dinner tomorrow. Thanks! Posted December 14th, 2016 at 12:34 am | Log in to reply. This recipe was very easy and tasted delicious! My husband was surprised how delicious this turned out. Posted December 14th, 2016 at 10:17 am | Log in to reply. Yum! I’m glad to hear that you got some compliment on your homemade bulgogi stew! Posted December 10th, 2016 at 8:13 pm | Log in to reply. 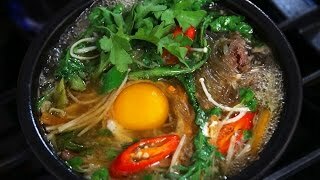 IMaangchi I love your channel and recipes. I went out and purchased my own little pots to make this dish and was wondering if I can use chicken instead of beef (not a big red meat eater). Thank you so much! Posted January 6th, 2017 at 7:53 pm | Log in to reply. Posted December 7th, 2016 at 5:26 pm | Log in to reply. Posted November 26th, 2016 at 3:54 pm | Log in to reply. A Korean place near me makes this and I tend to order it as winter appears. It’s so good, I think I might like it better than plain grilled bulgogi. 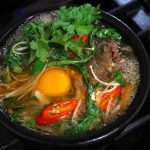 This recipe was originally posted on November 26, 2016 at 12:45 pm by Maangchi. The video was watched 1,126,058 times on YouTube & has 24,476 likes!